SustainableWork: Innovation Kitchen partners at the Food and Wine Show. Post 1. White Jasmine. Innovation Kitchen partners at the Food and Wine Show. Post 1. White Jasmine. The Wisconsin Innovation Kitchen is proud to support the food preparation needs of a wide variety of wonderful food companies. At this year's Madison Food and Wine Show we got the chance to visit with a few of our favorites. One of these is White Jasmine, an amazing food company based on a passion derived from providing fresh, natural and delicious spices to their customers. Their President, Ms. Huma Siddiqui is a local food star in Madison, WI. 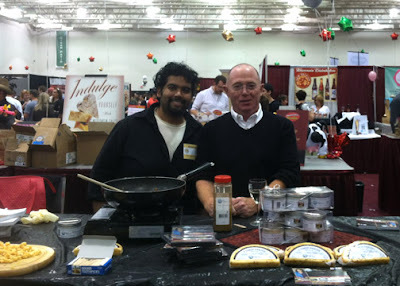 Photo above is our friend Samir Karimi, VP Sales of White Jasmine at this year's Madison Food and Wine Show. Thanks White Jasmine for your support of the Wisconsin Innovation Kitchen!